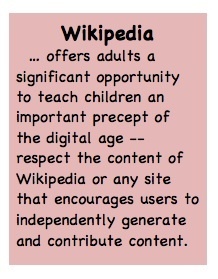 Parents (and Teachers) Ask Why Wikipedia? – Media! Tech! Parenting! Parents (and Teachers) Ask Why Wikipedia? “Why use Wikipedia?” adults often ask. What they are really asking is, “Should my kids use Wikipedia, and is it a real reference?” For adults who grew up in the age of multiple volumes of well-documented references, it’s hard to wrap our minds around Wikipedia — and even harder to use it. Digital natives, however, consult Wikipedia all the time, and the number of users and the content is increasing. According to a 2006 review in School Library Journal, “The popular online encyclopedia, whose entries are written and edited by any user, may inspire trepidation, even fear, yet the behemoth is impossible to ignore.” So just who is writing for Wikipedia? A March 2010 MSNBC article Who Writes Wikipedia, describes a research project that aimed to develop profiles of writers who contribute content. A timeless librarians’ creed — never rely on one reference and always confirm a fact — is perhaps the most important concept to keep in mind whenever anyone is seeking information. Bottom line: always reconfirm a fact from any source, no matter how expertise the writers claim to have on a topic. A few years back, the distinguished science journal Nature published a piece about Wikipedia and Encyclopedia Britannica. The article, Internet Encyclopedias Go Head to Head (abstract), compared Wikipedia articles written by experts with the same topics published by Britannica. The competition used no article written by the average reader or contributor. In theory, Wikipedia won, because it had fewer errors, however more than a bit of controversy surrounds the Nature article. The National Institutes of Health (NIH) recently decided that its scientists can check existing entries in their professional specialties, adding, citing, and correcting information as necessary. In a July 2009 Wired magazine article, Wikipedia Teaches NIH Scientists Wiki Culture, writer Alexis Madrigal describes how Wikipedia volunteers traveled to NIH, holding a Wikipedia Academy and training the scientists in the wiki writing process. Today, as a result of the decision, trained scientists from NIH Institutes and Centers write for the online encyclopedia. A document, NIH Guidelines for Participating in Wikipedia, helps them with their work. Bottom line, Wikipedia is here to stay. Use it, cite it, confirm the facts, click on the hyperlinks, and treat it like any reference. If you find an error, let the editors know or, if you have enough knowledge about a topic, fix it yourself.